where can I post my pictures and even a small video? This is in my profile, too. I'm sorry to hear this has happened to your family. I'm pregnant, and I develop rashes from elastic, spandex, fabric finishes, and dyes. I was always leery of the tagless shirts. 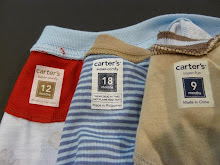 My baby will have cotton diapers and clothing without tagless imprints. 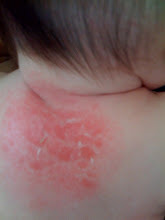 I won't even use commercial diaper wipes or flushable liners because I am afraid of getting a rash or giving the baby a rash. My skin is terribly sensitive. Some baby items can be ordered from Cottonique.com which sells mildly treated ivory cotton. Clothing manufacturers need to know that their fabric treatments and tagless designs are harming people. I am sick! 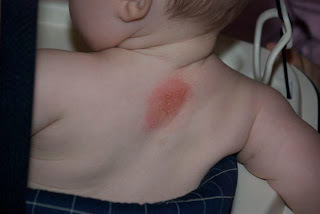 I just googled "my baby has a circular rash on her back" and your website popped up. 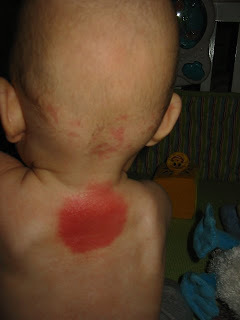 I've been to the pediatrician several times and even an allergist for this EXACT problem on our 18 month old daughter's back. The sore is in the EXACT same spot. One of your photos could BE our daughter from the back, the sore is so identical. The allergist was baffled and sent us back to our pediatrician. I took off work to take her to the doctor again tomorrow, Feb 3rd, but now I don't need to. I am just horrified that a company could knowingly let this continue!